After months of waiting, today is finally the day of Huawei’s Mate 20 announcement. And, while there may only be three hours to go until the event, this hasn’t stopped the leaks. In fact, this latest one provides perhaps the best look yet at Huawei’s entire flagship lineup. 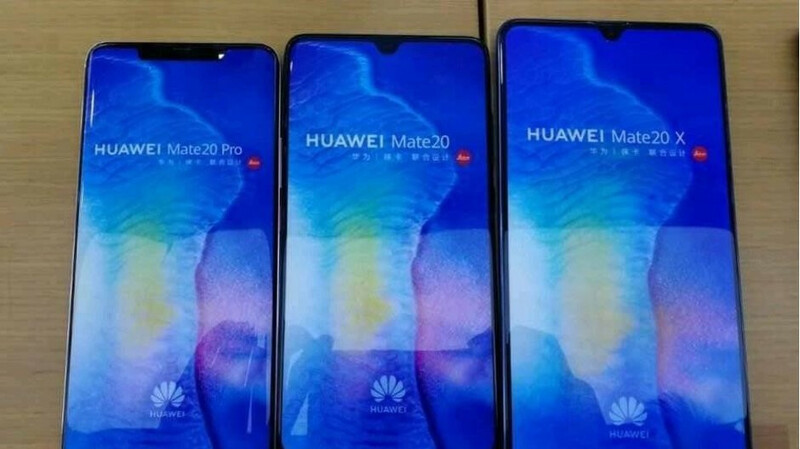 Looking at things from left to right, the image above showcases the Huawei Mate 20 Pro, the regular Huawei Mate 20, and the mysterious Mate 20 X which is expected to focus on gaming and also bring stylus support. Presently, the exact dimensions of each device remain unknown. However, it has been confirmed multiple times before that the regular model will boast a 6.5-inch display, while the Pro model will adopt a slightly smaller 6.4-inch panel complete with curved edges. The larger Mate 20 X, on the other hand, will feature a huge 7.2-inch display. Moving on to the images in the gallery below, there is, unfortunately, no direct comparison of the three devices from the rear. However, one image does compare the larger Mate 20 X to the smaller Mate 20 Pro, thus confirming a couple of details about the larger device. First off, much like the regular variant, the Mate 20 X will make use of a rear-facing fingerprint scanner rather than a more futuristic in-display solution, but it’s placed quite high up on the device so it’ll remain to be seen how easy the sensor is to reach. In any case, this smartphone is huge, so it’s to be expected. Secondly, the triple-rear camera layout can be seen. Presumably, all three sensors will match those of the Pro device. Finishing off with the remaining images, one of them confirms an upcoming pink Mate 20 Pro variant, while the final one showcases the retail boxes of each device. These resemble those of the Huawei P20 line quite closely, although they now make use of gray packaging instead of white. The 20X is a nice looking phone with exception of the notch.